Good morning! How was your weekend? It’s been a gloomy couple of days here in NH and the week ahead doesn’t look like it’s getting any better. Thankfully the sun poked it’s head out just for a minute and stopped raining so I was able to get some good photos of what’s in my car. 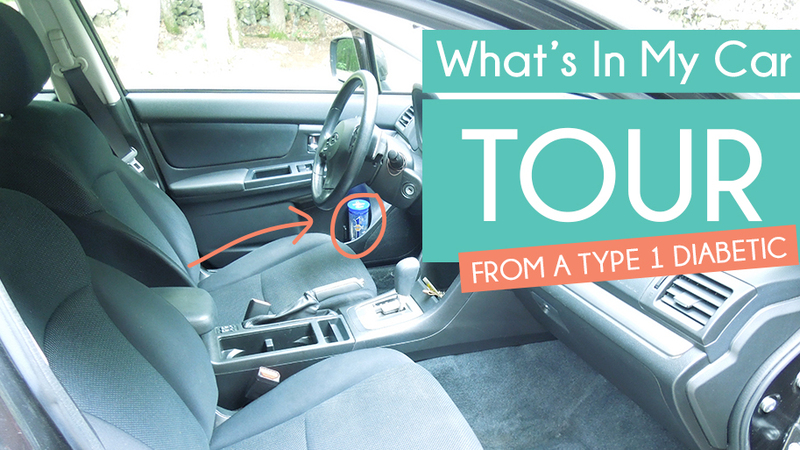 Here is an official car tour of a type 1 diabetic. 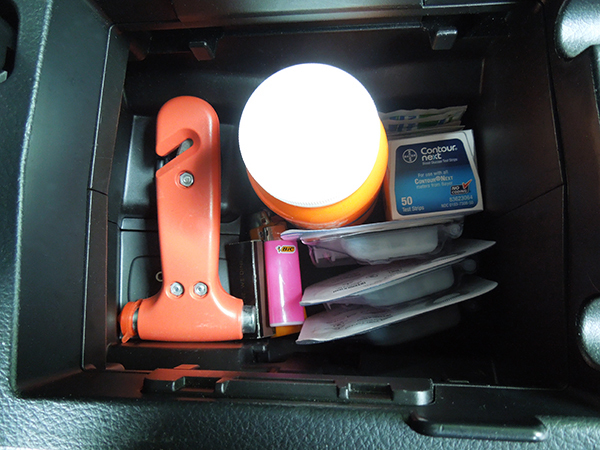 My car is loaded with T1D supplies; you know, for those “Oh sh*t I forgot my (insert diabetes supply here)” moments. The problem is, some T1D supplies are temperature sensitive and don’t do well when baking in a 150 degree car, or freezing at -10 degrees. I always love hearing/seeing how other diabetics pack their cars, so let me know in the comments below if you do anything the same or differently. 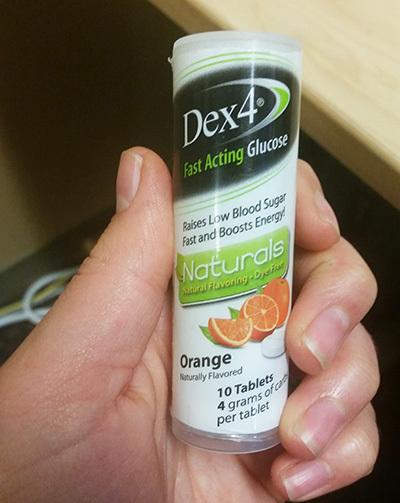 Glucose Tablets are my go to when treating a low. They taste like crap, but the get my blood sugar back into range FAST! Also, I never overtreat a low because the less chalk I have to eat the better. 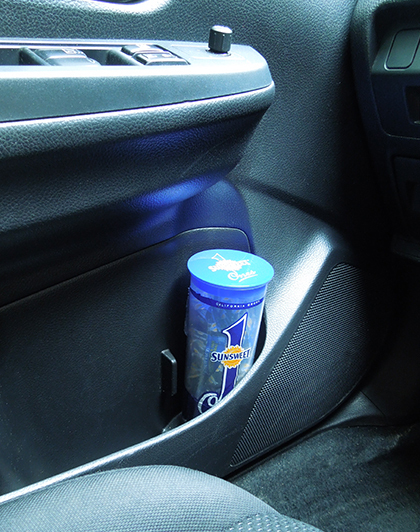 They’re also great for the car because they aren’t temperature sensitive like juice or candy. When low’s aren’t overly urgent (like a steady 65 mg/dL) I will typically snack on a non glucose-tablet source of sugar; one that I actually enjoy eating. Lately I have been loving these individually wrapped prunes. I’ve noticed that when I have snacks that are not individually wrapped (like a bag of jelly beans) I’m constantly reaching for them while I drive. It’s so easy to sneak my hand in and grab a few. I then convince myself that at the next red light I’ll bolus for all the extra I ate, but I forget and BAM! Now I’m dealing with high blood sugar. If insulin wasn’t so temperature sensitive I’d stash extras of that in my car too. When I was on MDI I can’t tell you how many times I’d have to turn around or leave early because I forgot my insulin pen at the house. Grr!